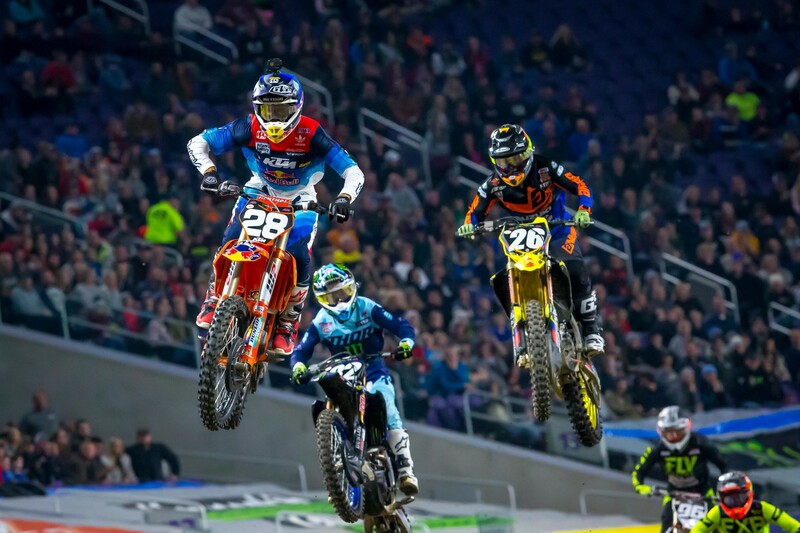 The 2019 season of Monster Energy Supercross won’t give up on the thrills and chills, as round six in Minneapolis, Minnesota’s U.S. Bank Stadium presented an instant-classic barnburner main event, with six riders battling in formation for the lead well past the halfway mark. It was an epic fight and symbolic of an incredible season that keeps setting records for tight points totals. After this one, more than a third into the season, just two points separate four riders in the standings. 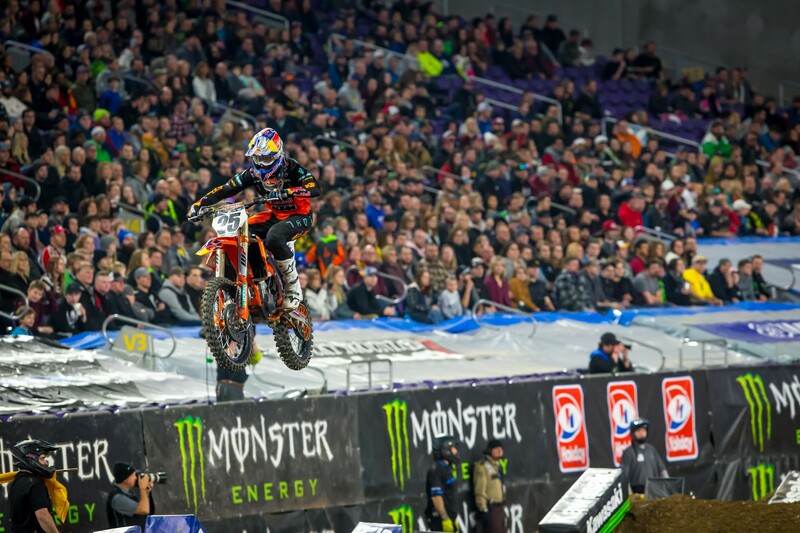 But in the win column, one rider stands well ahead of the rest, with Red Bull KTM’s Cooper Webb avenging an endo in last week’s San Diego mudder to return to the top, his third win of the young season. Webb was strong all night, winning his heat and then battling for the lead in the main immediately with Joey Savatgy. It turned into a dogfight because of a strange reason—the track actually didn’t offer up much passing, which actually led to better racing, because as Webb couldn’t figure a way around Savatgy, Ken Roczen couldn’t get around Webb, and Blake Baggett couldn’t get around Roczen, and Justin Brayton couldn’t get around Baggett, and Marvin Musquin couldn’t get around Brayton. It was intense! It took more than half of the race for Webb to finally force Savatgy into a mistake. 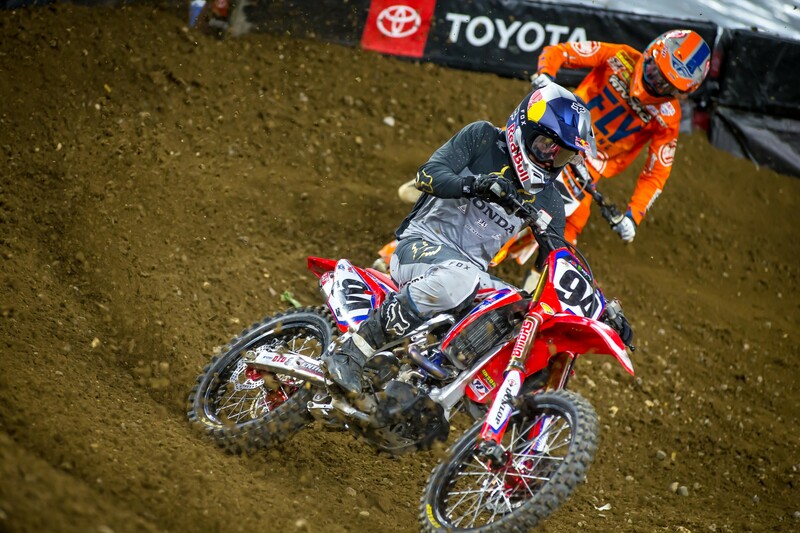 Webb’s pass on Savatgy was key, because Roczen and Baggett might have been just as fast. But Cooper put the hammer down once he pulled away from Joey, and Roczen, Bagget and later Musquin (who passed Brayton) couldn’t get the Kawasaki rider. Once Roczen got through, Baggett and Musquin really started applying heat to Savatgy, and then Savatgy bobbled hard in a rhythm lane and both KTM riders shot past him in the whoops soon after. Then Baggett tossed it away violently in a rhythm lane. His race was done, but after taking a few minutes to collect himself, Baggett was able to ride his mangled bike off to the pits under his own power. This put Musquin into third. Savatgy ran a great race, but lost steam about 15 minutes in after facing relentless pressure the whole way. He held on for fourth, a career high in his young 450 career. Brayton, after a thumb injury that knocked him out of last weekend’s race, was back on form, winning a heat race and finishing fifth in the main. Just as Webb followed a disappointing eighth last weekend with a win here, Eli Tomac went the opposite way, winning San Diego but then starting terribly here and only methodically pulling through for sixth. It takes the red plates off of his Monster Energy Kawasaki and hands them back over to Roczen. 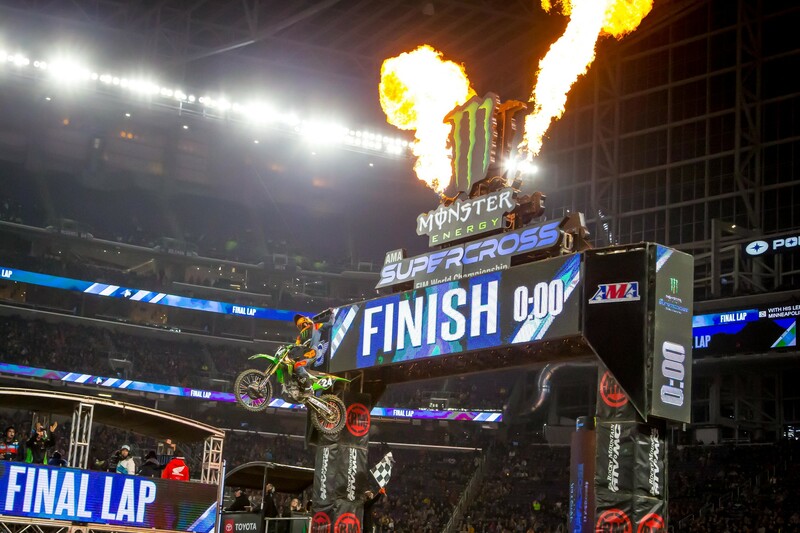 250 SX East kicked off and Austin Forkner proved to be the real deal when it counted in the night show. 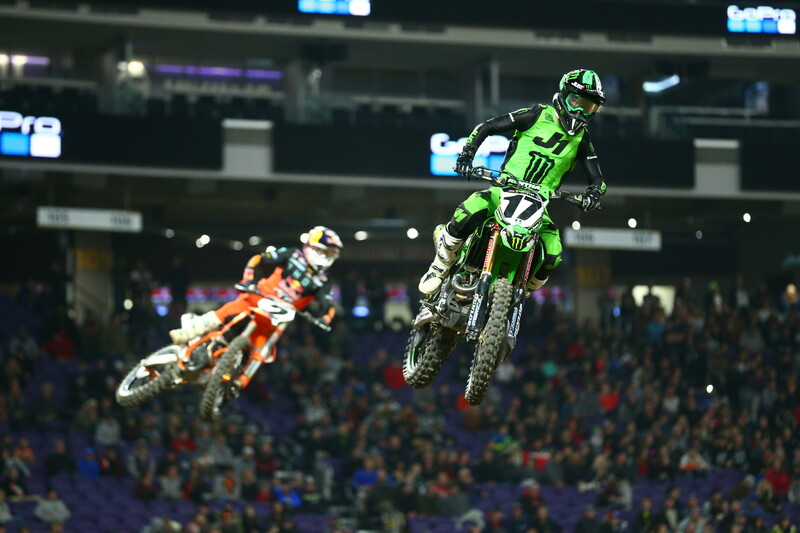 The Monster Energy/Pro Circuit Kawasaki rider had a bunch of crashes in practice, but was rock-solid on a beat up track in his heat and the main event. TLD/Red Bull KTM’s Smith looked smooth in the afternoon, but his main event was absolutely wild. It started with a flat tire on the parade lap for the main event! His team barely got the rear wheel changed out in time, and Smith hopped on the bike with, by his estimate, seven seconds to spare. Smith did a lot of battling, passing Chase Sexton, Alex Martin and Martin Davalos, only to fall himself, and then re-pass Alex Martin and Justin Cooper to net second. 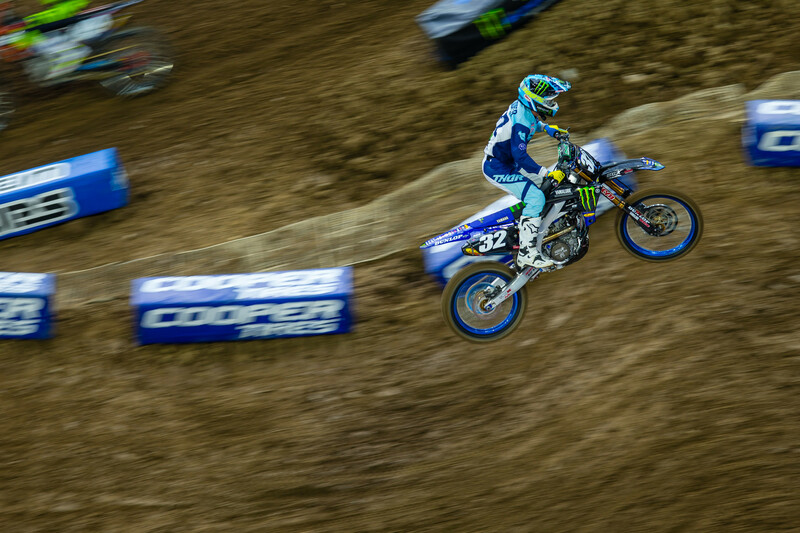 Justin Cooper, of Monster Energy/Star Racing Yamaha, netted his first career supercross podium (this is actually only his second career SX race) by outdueling Alex Martin for third. Martin was quick all day and night on his JGR/Yoshimura Suzuki, and held Cooper at bay for nearly the whole main, in the search for a podium. He ended up bumped off the track by Cooper and missed the transponder line at the finish. His team had to go and request a manual rescoring of that lap for Alex to be credited with fourth place—he was first considered a lap down, and 11th, by not getting credit for the lap when he was bumped off of the finish line jump. Chase Sexton was fourth on his GEICO Honda. He ran into the back of Alex Martin and crashed at one point. Mitchell Oldenburg was fifth. Martin Davalos, expected to be a title contender, had a rough night filled with crashes and finished 16th. 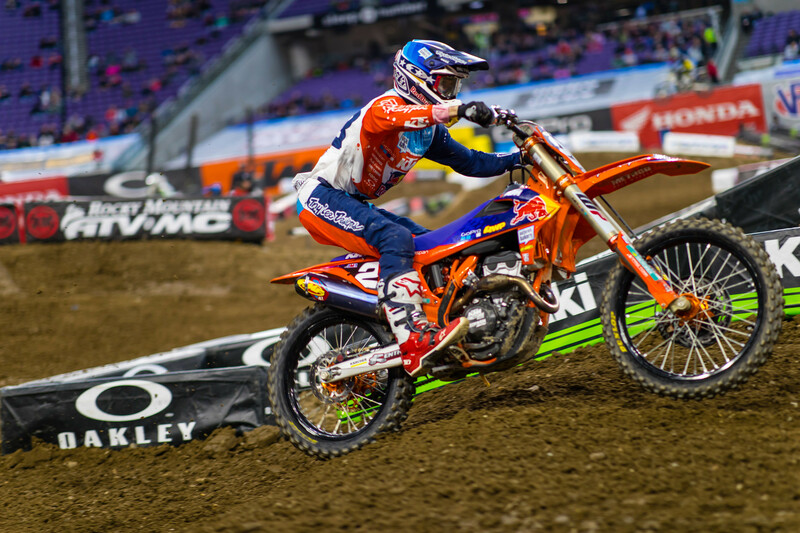 Christian Craig, who only got back on a supercross track four days ago after an off-season thumb injury, struggled and salvaged 20th.